Spring blooms shouldn’t get all the love! Fall is the perfect opportunity to add some festive focal points to your containers and flower beds. 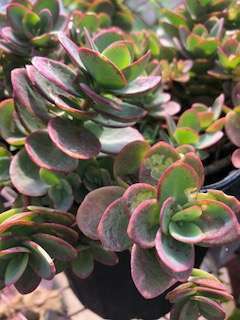 We suggest sedum for the remarkable array of color it can add to your arrangements around this time of year and how easy it is to care for. Sedum is an extremely versatile plant, thriving in containers and landscape beds as a filler or the center of attention, throughout multiple seasons of the year! This forgiving and low-maintenance perennial comes in all shapes, sizes and colors. For the best results, place them in the sun with well-drained soil. They tolerate the heat, sun, and drought very well, but over-watering will be the death of them! Their thick, succulent leaves store H2O, so be sure you are watering them effectively. FUN FACT: In older versions of English translations, Sedum, or its alternative name, Stonecrop, is translated to “sprouting from the stone” in reference to their grit and inspiring the old garden saying, “only stones require less care and live longer than Sedum” (The Gardener’s Network). 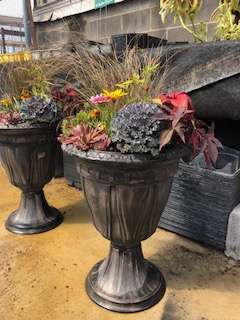 Pair them with a perennial grass- both 25% off in our Garden Center RIGHT NOW! 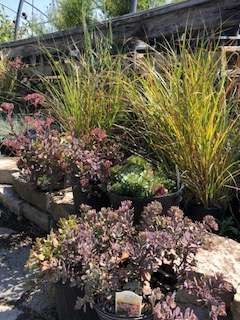 Perennial Grasses and Sedum varieties all 25% off!